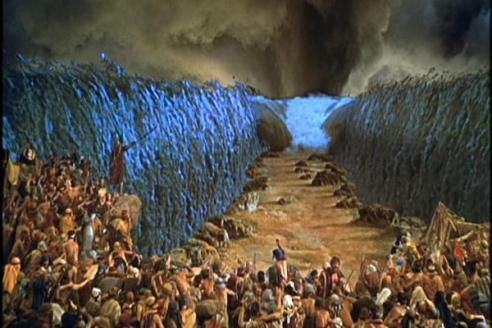 Torah Codes 2012 by Midbar Nesher: The Wall of Water from the Book of Exodus. What is truth and what is false? One way to understand the scriptures is not guided by deceptive movie about the Bible because all the movie directors turn out to be a false prophets and these adulterate the biblical stories to impress the people for after they sell their bad films at a high price. What is the reality of these events that are written in the Bible? because many people ignore thinking that the waters of the Sea was myth and the best way to understand many of these events is to see the world around us and learn about the Natural Events that occur in different parts of the World; These Events are also Signs of the End of Time. 1.Exodus 14:24 Starting with the second letter צְ of the seventh word counting forward every seven letters. 2.Exodus 14:24 Starting with the sixth letter ה of the eleventh word countig forward every four letters. כב וַיָּבֹאוּ בְנֵי-יִשְׂרָאֵל בְּתוֹךְ הַיָּם, בַּיַּבָּשָׁה; וְהַמַּיִם לָהֶם חוֹמָה, מִימִינָם וּמִשְּׂמֹאלָם. 22 And the children of Israel went into the midst of the sea upon the dry ground; and the waters were "A wall unto them on their right hand, and on their left"
כג וַיִּרְדְּפוּ מִצְרַיִם, וַיָּבֹאוּ אַחֲרֵיהֶם--כֹּל סוּס פַּרְעֹה, רִכְבּוֹ וּפָרָשָׁיו: אֶל-תּוֹךְ, הַיָּם. 23 And the Egyptians pursued, and went in after them into the midst of the sea, all Pharaoh's horses, his chariots, and his horsemen. כד וַיְהִי, בְּאַשְׁמֹרֶת הַבֹּקֶר, וַיַּשְׁקֵף יְהוָה אֶל-מַחֲנֵה מִצְרַיִם, בְּעַמּוּד אֵשׁ וְעָנָן; וַיָּהָם, אֵת מַחֲנֵה מִצְרָ(יִ)ם. 24 And it came to pass in the morning watch, that the LORD looked forth upon the host of the Egyptians through the pillar of fire and of cloud, and discomfited the host of the Egyptians. כז וַיֵּט מֹשֶׁה אֶת-יָדוֹ עַל-הַיָּם, וַיָּשָׁב הַיָּם לִפְנוֹת בֹּקֶר לְאֵיתָנוֹ, וּמִצְרַיִם, נָסִים לִקְרָאתוֹ; וַיְנַעֵר יְהוָה אֶת-מִצְרַיִם, בְּתוֹךְ הַיָּם. 27 And Moses stretched forth his hand over the sea, and the sea returned to its strength when the morning appeared; and the Egyptians fled against it; and the LORD overthrew the Egyptians in the midst of the sea. כח וַיָּשֻׁבוּ הַמַּיִם, וַיְכַסּוּ אֶת-הָרֶכֶב וְאֶת-הַפָּרָשִׁים, לְכֹל חֵיל פַּרְעֹה, הַבָּאִים אַחֲרֵיהֶם בַּיָּם: לֹא-נִשְׁאַר בָּהֶם, עַד-אֶחָד. 28 And the waters returned, and covered the chariots, and the horsemen, even all the host of Pharaoh that went in after them into the sea; there remained not so much as one of them. כט וּבְנֵי יִשְׂרָאֵל הָלְכוּ בַיַּבָּשָׁה, בְּתוֹךְ הַיָּם; וְהַמַּיִם לָהֶם חֹמָה, מִימִינָם וּמִשְּׂמֹאלָם. 29 But the children of Israel walked upon dry land in the midst of the sea; and the "Waters were a Wall" unto them on their right hand, and on their left. ל וַיּוֹשַׁע יְהוָה בַּיּוֹם הַהוּא, אֶת-יִשְׂרָאֵל--מִיַּד מִצְרָיִם; וַיַּרְא יִשְׂרָאֵל אֶת-מִצְרַיִם, מֵת עַל-שְׂפַת הַיָּם. 30 Thus the LORD saved Israel that day out of the hand of the Egyptians; and Israel saw the Egyptians dead upon the sea-shore. 1.The letter codes spells: צְוּןמַיִ : "Tsunami"
"A wall unto them on their right hand, and on their left"
2.The letter codes spells: היִסַא : "Asia"
This letter: יִ of the word Asia to intersection with the same letter of the word Tsunami. The adjacent letter at the same ELS spells: "Wall of Water"
The 2004 Indian Ocean earthquake was an undersea megathrust earthquake that occurred at 00:58:53 UTC on Sunday, December 26, 2004; The resulting tsunami is given various names, including the 2004 Indian Ocean tsunami, South Asian Tsunami, Indonesian Tsunami. 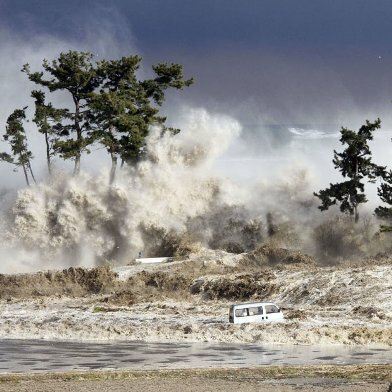 The earthquake was caused by subduction and triggered a series of devastating tsunamis along the coasts of most landmasses bordering the Indian Ocean, killing over 230,000 people in fourteen countries, and inundating coastal communities with waves up to 30 meters - wall (98 ft) high. 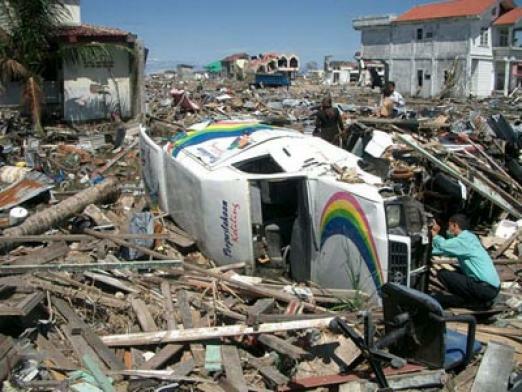 It was one of the deadliest natural disasters in recorded history. Indonesia was the hardest hit, followed by Sri Lanka, India, and Thailand. 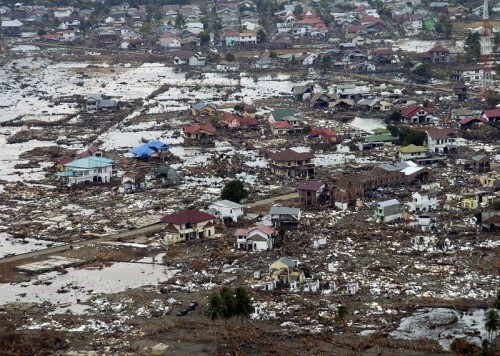 2004 Indian Ocean earthquake and tsunami. 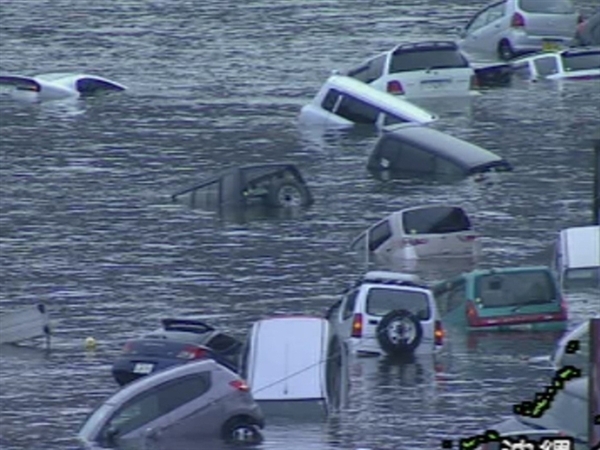 The March 11 earthquake and tsunami didn’t just destroy more than 410,000 new cars in Japan. 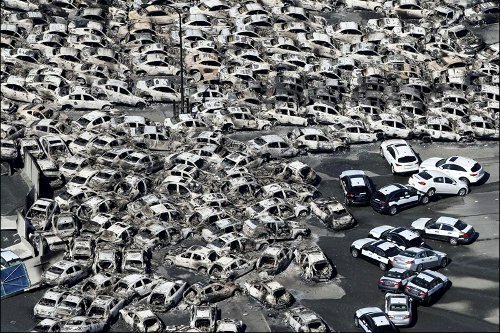 It also totally mangled the list of top selling cars in Japan. 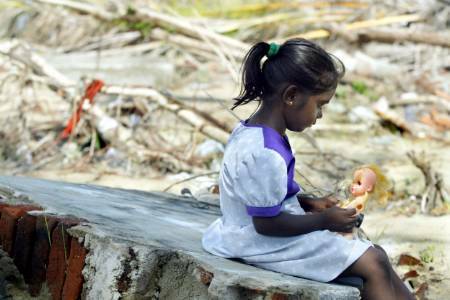 A 3 year old Sri Lankan tsunami survivor, Salomia, whose parents are not to be found, holds a broken doll sitting atop a broken wall of her destroyed tsunami-house in the town of Kalmunai on Sri Lanka's east coast. Ezekiel 18:32 For I take no pleasure in the death of anyone, declares the Lord God. Repent and live!